« THERE’S A NEW BRIAN K. VAUGHAN COMIC COMING IN 2012!!!! 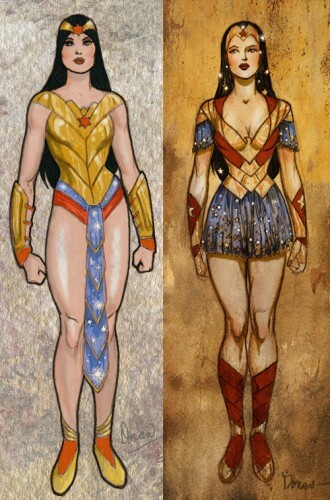 Alternative designs are a good time… it’s fun to see characters in a different context, and I think a fantasy version of Wonder Woman could be interesting. I really dig a lot of elements of these designs, and I bet the end result would have been a cool take on the character. 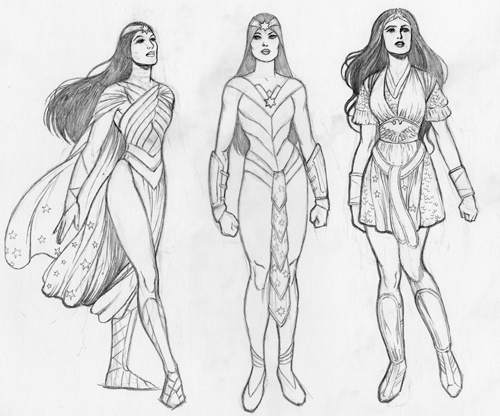 Doran worked in tons of elements from the classic Wonder Woman costume, and all of these sketches are obviously Wonder Woman but at the same time are new and different. It looks like this fantasy Wonder Woman might have been JMS’ plan for Wonder Woman after the “Odyssey” storyline wrapped up, but with JMS leaving the book to focus on the next Superman: Earth One book and now the DC relaunch, it appears that this is never going to happen. Maybe down the road, JMS will do it as a graphic novel or something. While I’m not super enthused about “Odyssey” (or JMS’ DC work generally), he’s done some cool stuff in the past and it would be nice to have some more standalone Wonder Woman stories on the shelves. This entry was posted on July 26, 2011 at 3:17 pm and is filed under Comics, WW Comics, WW Miscellany. You can follow any responses to this entry through the RSS 2.0 feed. You can leave a response, or trackback from your own site.